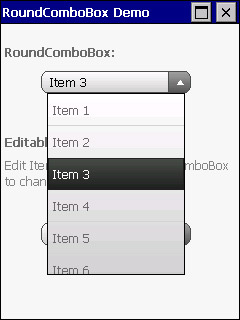 RoundComboBox is a .NET CF control perfect for displaying a list of items while saving precious space on the small display of a Windows Mobile device. 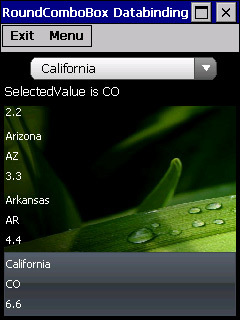 Unlike a standard ComboBox, Bee Mobile’s RoundComboBox provides a sleek GUI and an expanded list of items that can be smoothly scrolled through with a touch of your finger. It is also possible to use chosen PNG image instead of a predefined arrow. 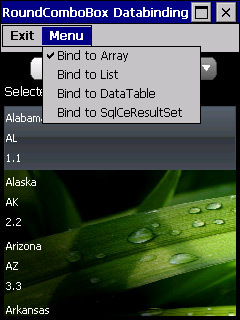 NEW: Databinding support allows you to bind your RoundComboBox to different data sources (e.g.array, List<>, DataTable, SQL CE DataBase). 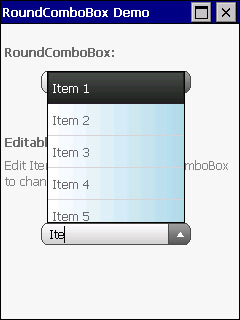 New improvement is also a possibility to use chosen PNG image instead of a predefined arrow which is used for expanding list of item.